We understand the importance of having a well trained, efficient, and pleasant staff. We are proud that the staff of Greater Binghamton Obstetrics & Gynecology exemplify these values on a daily basis. Monica Silas is our “practice manager” for Greater Binghamton Obstetrics & Gynecology, but her role is much more extensive. She is the one that will go above and beyond to make you feel at home. Monica has been a special part of some families for generations. Her many years of experience in assisting our providers and patients in coordinating their healthcare needs comes naturally. 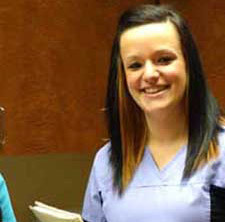 Irina Kibukevich graduated from SUNY Broome’s MOA program. She has been with us ever since we moved to our new location. She hails from the Ukraine but recently became an American citizen! Irina is warm and engaging and will make you feel welcome and comfortable no matter the reason for your appointment. 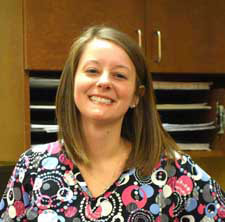 Katelyn Goetz has prior pharmacy experience but has been a part of the Greater Binghamton Ob/Gyn family for several years. She loves seeing the babies visit after moms deliver! Kate takes care of our patients as an MOA but also does much of the behind-the-scenes work that keeps the office running so smoothly. 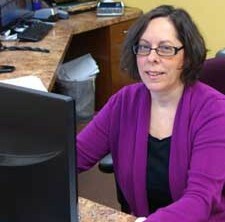 Shazery Fink is our newest staff member. She attended University of New Hampshire where her focus of study was nutritional science. Spend a minute with Shaz and you will know that she is genuinely interested in your well-being and always happy to help you in any way. A great addition to our staff! Kathy Peguero is a registered ultrasound technician who makes your ultrasound experiences memorable. She is incredibly knowledgeable and experienced. Although her job demands serious medical screening, there is always a lot of laughing coming from her room! You will get great pictures when Kathy is your baby’s first “photographer. 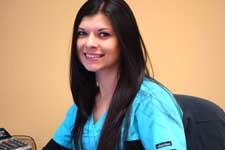 Jessica Fish is another one of our registered ultrasonographers. She is always smiling and is always happy to be here. We feel the same about having her! Nicole Leonard offers hypnobirthing / relaxation technique sessions by arrangement. You may email her or make arrangements through the office.